(2012.201.B0092.0219, photo by J. Argo, Oklahoma Publishing Company Photography Collection, OHS). (2012.201.B0091.0123, photo by P. Southerland, Oklahoma Publishing Company Photography Collection, OHS). (20778.AG.SCS.OKLA.5111, Edd Roberts Collection, OHS). (22387.21, Oklahoma Historical Society Photograph Collection, OHS). Before the advent of non-Indian people in the lands that became Oklahoma, Native inhabitants generally believed that trees, hills, rocks, lakes, and other objects of nature contained guardian spirits. Indians accepted the premise that they were, whenever possible, to live in harmony with nature. Their function was to enjoy and protect what they had been bequeathed. The land gave them their livelihood and identity. The pioneers, with their Christian religion and capitalist ethos, brought with them a markedly different outlook. Rather than being caretakers of the earth, their relationship with nature was to be its master, to "tame" their environment, to bring the technology of the nineteenth-century Industrial Revolution and its scientific achievements, to the extent that their means allowed, into an area that advanced quickly from a territorial status to statehood. Following the biblical injunction to "be fruitful and multiply and replenish the earth and subdue it," the faithful were challenged to convert their newly acquired lands into a veritable garden. Their conception of work involved mining, logging, and especially farming. Because viewpoints differed at the outset within the boundaries of Oklahoma, which by 2000 was a state with a very large population of American Indians, seeds of culture conflict were sown. Indian beliefs and values persisted though their supporting economic and political structures vanished, were adapted, or were absorbed into the dominant white culture. What holds for Indians holds as well for white and African American Oklahomans: the values they attached to pioneering persist in cheerful defiance of contrary evidence. The values, however, were not monolithic, as different environments produced different cultures. Nor was it surprising that a society spread thinly across the land exhibited, in most instances, a privatized culture. Oklahoma was admitted into the union as the forty-sixth state on November 16, 1907, but there was no consensus as to whether it was a southern state, a plains state, or a southwestern state. It all depended on the settler's perception. Noting a farm enclosure for livestock, for example, a southern settler probably would signify it as a cow pen, a settler from Kansas or further north and east would call it a barnyard, and a Texan most likely would designate it as a corral. Located largely between the 33rd and 37th Parallels north and the 94th and 103rd Meridians west, Oklahoma, with seventy-seven counties, ranks eighteenth in size among the states and occupies almost seventy thousand square miles. With the exception of Minnesota, it is larger than any state east of it and smaller than any other western state, except Washington and Hawaii. Oklahoma is unusual in that it was cobbled out of territory other states did not want as part of their domain and out of land set aside by the federal government to be "forever a home for the Indians." Oklahoma then was created as a dumping ground for Indians and as a meeting ground for peoples from other countries and sections of the nation. During the last decade of the twentieth century Oklahoma had a population of 3,145,585. Many of the more than 260,000 Indians in the state are descendants of the original sixty-seven tribes forcibly located in Indian Territory. They comprise 7.8 percent of the population, and African Americans comprise 7.7 percent (257,000). People of Asian descent comprise 1.3 percent (42,800) of the state's inhabitants. In addition, at the end of the century more than 122,000 people of Hispanic origin lived in Oklahoma, chiefly part of the 83 percent (2,757,300) of the white population. In the late-nineteenth- and early-twentieth-century concentrations of Italian, German, Pole, Czech, Slovak, and Mennonite (chiefly Russian and German) immigrants brought their own traditions to eventually merge with those of the other white population. In general, eastern Oklahoma is more densely populated than western Oklahoma, with the metropolitan areas of Oklahoma City and Tulsa containing between them about 1.8 million people. The remaining major cities, all under one hundred thousand people, with the exception of Enid, either border Interstate 35 or are east of the highway. Counties along the western border of the state, including the Panhandle, have the fewest inhabitants and the lowest population density. Like its variations in peoples Oklahoma is characterized by variations in climate, landforms, soils, and vegetation. Mountainous lands give way to extensive areas of almost level plains. The atmosphere above is a meeting space for polar continental and tropical maritime air masses. Heavy rainfalls and violent storms are caused by the mixing of cold, dry polar fronts and warm, moist tropical fronts. Tornadoes occur quite commonly, with April and May being the most active months. Between 1875 and 1970 more than sixteen hundred tornados struck Oklahoma. In 1997 the state experienced fifty-seven. But the most devastating by far occurred on May 3, 1999. Oklahoma's climate then reflects the nature of its geography. Average annual precipitation varies from more than fifty inches in the pine forests of the Ouachita Mountains in the southeast to approximately fifteen inches on the High Plains of the western Panhandle. The dimensions of the state, coupled with its geographic diversity, create situations in which one area suffers drought while another enjoys surplus water. Similarly, there is a wide variety of soils, some highly productive and others of little or no value for yielding crops. Vegetation ranges from forest, which covers about 23 percent of the state's land area especially in eastern Oklahoma, to prairies in the central areas to steppe grasslands of the western portions of the state. But even these lands are snaked by strands of trees along the watercourses. As historian Angie Debo noted, the state "probably has more kinds of country, more kinds of weather, and more kinds of flora and fauna than any other area of similar size in the United States." Oklahoma then is a transition land. The eastern and western halves of the state differ physically in landforms, vegetation, and climate. They differ culturally from the contrasting development of Indian Territory, Oklahoma Territory, and the Panhandle, areas consolidated in 1907 into the state of Oklahoma. In addition, the northern and southern halves differ in length of growing season, in crops (cotton, initially in the southern half, and wheat in the northern half as the chief crops), in roughness of local topography, and in culture, because of settlement by people from the northern and southern sections of the nation. In a transition land such as Oklahoma, different ideas, traditions, and viewpoints come together and mingle. At times this was done successfully, leading to profitable agricultural, mining, and industrial activities. Where people and nature have not worked well together, there are areas of severely eroded farmlands, denuded forests, polluted waterways, mining spills, decaying towns, and villages accompanied with human poverty. Oklahoma lies on a northwest-to-southeast drainage plain with such a scramble of landforms that some streams flow north and west before entering the drainage pattern. The land rises from 300 feet above sea level near Idabel in the southeastern portion of the state to 4,973 feet in the Black Mesa region of the Panhandle. The state is a patchwork of plains, hills, and mountains and, moreover, is drained by two great river systems, the Arkansas and the Red. The Arkansas, born in the Colorado Rockies, enters Oklahoma in the north, gathering the Salt Fork, Chickaskia, Cimarron, Verdigris, Grand, and Illinois rivers. The Canadian River is its principal southern feeder. The North Canadian, formed at the junction of the Beaver River and Wolf Creek in the Panhandle, enters the Canadian near Eufaula. The Red River, forming on the High Plains of the Texas Panhandle, delineates Oklahoma's southern border, gathering in its course the waters of the North Fork, the Washita, the Boggy, the Blue, and the Kiamichi. Until the 1870s rivers were main arteries of transportation. Into the 1920s keelboats plied the upper waters of the Arkansas and Red and some of their tributaries. A century earlier, in the 1820s and 1830s, steamboats had plied the Arkansas and Red and had traversed the navigable portions of some of their tributaries. The Missouri, Kansas and Texas Railway (MK&T or Katy), the first railroad to operate in Oklahoma, ran trains to Muskogee in the Creek Nation, Indian Territory. Late in 1872 the MK&T crossed the Red River into Texas at Colbert's Ferry. At 1907 statehood more than five thousand miles of track crisscrossed Oklahoma. Indian governments were not enthused about railroads, fearing the trains would bring droves of white settlers. And the settlers, like the Populists before and Progressives after statehood, were suspicious of railroads and of other out-of-state corporations. The railroads in turn, besides encouraging settlement, sought to develop natural-resources tonnage. Seeking to recruit coal miners, the railroads sent agents to Europe to hire men to work in the mines in the Choctaw Nation. Because Indians in general were not interested in becoming miners, immigrants from several European countries were brought to eastern Oklahoma. Another extractive industry active before statehood was zinc and lead mining in the Tri-State Mining District in northeastern Oklahoma. This industry developed when prospectors entered Indian Territory in 1891. By the 1980s, when mining activities were no longer significant, the Environmental Protection Agency ranked the area among the nation's most hazardous waste sites and assisted a campaign to eradicate seventy million gallons of acid mine waters that over decades had formed as groundwater and now spilled to the surface. In other parts of the Indian nations springs and streams with green slicks of oil were valued for their therapeutic qualities. In the Chickasaw Nation natural gas spewed to the surface, allowing Indians to light their council fires with torches fueled by it. Both oil and natural gas would become gigantic industries in the twentieth century, with discoveries occurring in almost every county in the state. In eastern Oklahoma oak and hickory forests dominate the Ozark Plateau in the northeast and the northern and western sections of the Ouachitas. In the southeastern corner pine forests dominate. First water-powered and then steam-driven sawmills yielded huge cargoes of hardwoods and pine that were shipped by rail to eastern markets. At the end of the twentieth century the industry still thrived on a sustained yield basis. As one proceeds from east to west, the land and its use changes from woodlands to semiarid grasslands. In between, there are gently rolling prairie farmland, wooded hills, meadows that provide pasture for livestock, broad basins, scenic mountains, deciduous forests, grasslands, a major salt plain containing a wildlife refuge, sand dunes, and vast expanses of winter wheat and other crops. The Cross Timbers, a large, wooded area, extends through central portions of the state, separating eastern forests from the largely treeless western plains. Oklahoma flora run the gamut from cypress trees in the warm southeast to pinyons in the wind-swept Panhandle. Western Oklahoma contains several ranges of sandstone and gypsum hills. The granite peaks of the Wichita Mountains rise abruptly from the plains of southwestern Oklahoma. The high plains of northwestern Oklahoma have an elevation in excess of 2,000 feet above sea level and rise to more than 4,500 feet in Cimarron County in the western portion of the Panhandle. Cimarron County is the only county in the nation that borders four states: Kansas, Colorado, New Mexico, and Texas. On the western plains, before Oklahoma was organized as a territory in 1890, bison (buffalo) were slaughtered for their hides, tongues, and hindquarters. While cattle raising was evident before the Civil War in the Indian nations, the cattle industry expanded enormously in the late nineteenth century and today is a major economic activity in western Oklahoma. Tensions that arose in the post–Civil War years united cattlemen and the Indian tribes in opposition to further development, while bankers, businessmen, and railroad executives seeking additional homesteaders encouraged it. Tensions continued in the years following the opening of the Unassigned Lands to settlement in 1889. Thereafter, agriculture became the dominant industry. By the 1930s thoughtless farming practices, the one-way plow, and one-crop farms sacrificed (during the Depression years) one third of the topsoil to wind and water erosion. 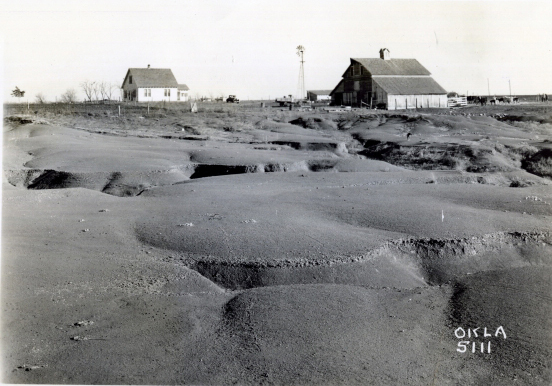 These factors, combined with drought and whipped by black "dusters" chiefly in the western counties, created an ecological disaster of huge proportions, one that drove many Oklahomans from the land to the cities and led others to leave the state. Indeed, the population of some counties at the end of the twentieth century had not exceeded that of 1930. In response to this disaster a State Planning and Resources Board was created in 1935 to assume jurisdiction over parks, forestry, and water resources. Thereafter, with federal assistance, particularly from the U.S. Army Corps of Engineers, numerous man-made lakes and dams were constructed. Conservationists, flood control advocates, navigation interests, and others worked to control flooding, promote irrigation, and make Oklahoma verdant and productive once again. In 1946 Congress authorized a comprehensive plan of development for the Arkansas River, the last major undeveloped river in the nation. In 1971, some sixty-five years after the last of the river steamers coursed the waterway from Fort Smith to Muskogee, the McClellan-Kerr Arkansas River Navigation System's 440-mile water stairway allowed barges to leave the Port of Catoosa on the Verdigris River. Tulsa and Muskogee also developed port facilities, enabling them to ship and receive, via barges, goods destined for or received from New Orleans and ports either before or beyond the Crescent City. Dams created seven upstream reservoirs in eastern Oklahoma. They play a major role in the Arkansas River Navigation System. Oklahoma's man-made lakes provide recreational facilities, encourage tourism, and in some instances provide water for irrigation in the western portions of the state. Some dams also generate electricity, which in turn encourages industry. In all, twenty-nine major federal reservoirs are located in Oklahoma. Lake Texoma and Lake Eufaula are among the largest man-made reservoirs in the nation. 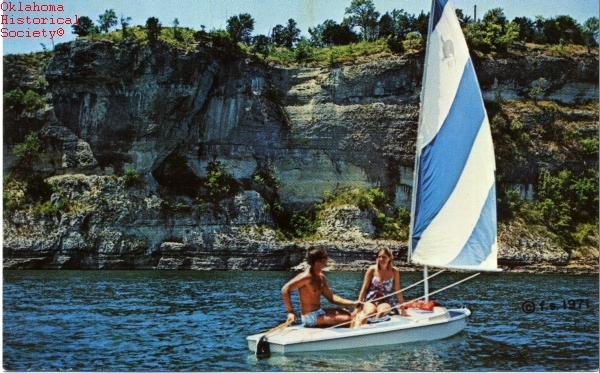 Virtually all lakes within the state are man-made. The total surface area of the water bodies in Oklahoma exceeds twelve hundred square miles. Today, a Water Resources Board plans for the orderly control, protection, conservation, development, and utilization of the state's water resources. In addition to conservation storage in major reservoirs, by the 1980s Oklahoma had some three million acre-feet of flood control storage in almost two thousand lakes completed by the Soil Conservation Service of the U.S. Department of Agriculture. 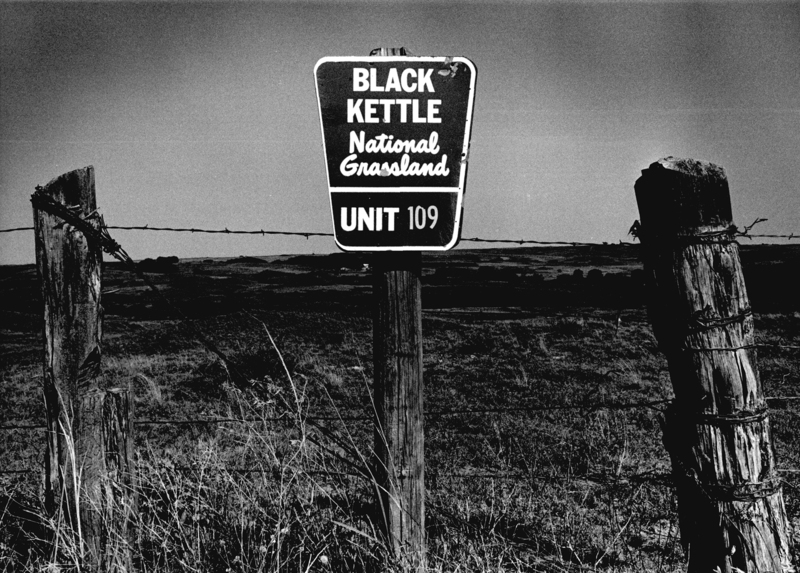 Land treatment practices to curb flooding were evident by the 1950s. Not to be overlooked is the development of groundwater. Vast amounts buried in geologic formations and yield their waters to thousands of wells and springs. Most important is the Ogallala Aquifer, a vast underground water resource that extends from Nebraska to Texas and underlies two-thirds of the Panhandle. The reserve is being diminished at a rate that alarms many observers. Its waters irrigate corn and other feed crops, allowing for the development of feedlots and packing plants. Tensions were created when petroleum producers in the Panhandle exploited the aquifer to flush oil from depleted fields (large portions of the Hugoton-Guymon field, the nation's largest natural gas field and the world's second largest, underlies much of Beaver and Texas counties in the Panhandle). 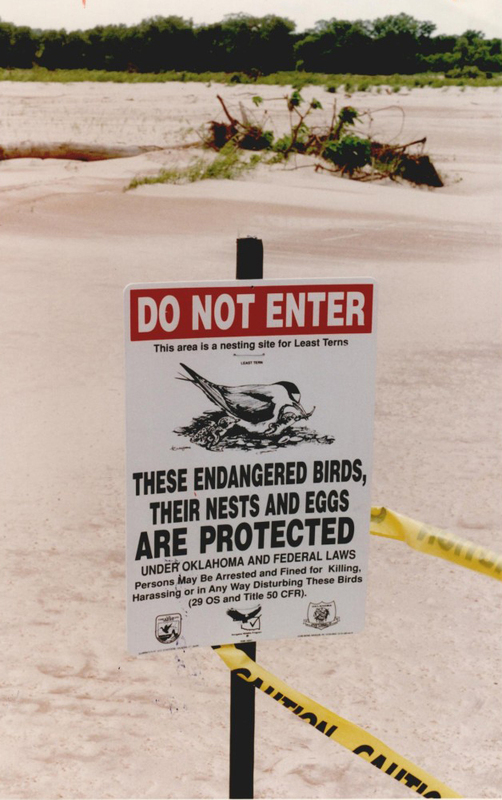 While users of the Ogallala are conservation conscious, some authorities believe that the Oklahoma portion of the resource will be depleted before the twenty-first century ends. As already indicated, agriculture is a major component of the environment and the economy. About thirty-four million acres of land are included in more than seventy thousand farms and ranches operating in the 1990s. The cattle industry is the major agricultural enterprise in terms of the value of total production, but more than fourteen million acres are designated as cropland. Winter wheat is the leading crop in terms of acreage planted and total crop value. Other important crops include peanuts, cotton, hay, soybeans, and grain sorghum. Important non-crop agricultural products include poultry/eggs and hogs/pigs. Agricultural products significant on a local basis include corn, oats, peaches, barley, rye, sheep, goats, and catfish. Virtually every community in Oklahoma is related one way or another with the agricultural economy. This endeavor dominates the state's land use and affects perceptions of space and place. It is a major factor in defining Oklahoma's identity. Looming above a flat horizon, grain elevators identify market points and agricultural and commercial centers. These structures provide verticality on an otherwise flat landscape: they range from small country elevators to massive terminal elevators with towering concrete bins in long parallel lines that store millions of bushels of wheat and dispatch huge shipments to distant markets. The railroad provides the link, bridging space to bring the wheat from small rural elevators to terminals from whence it is shipped to markets near and far. In addition, local and regional processing elevators mill grain into flour sold to bakeries. Although only four flour mills operated in the state by 1992, milling remains an important manufacturing industry. These elevators provide a fine example of form following function, an engineering solution to a critical agricultural concern. At one time cotton was grown throughout eastern Oklahoma. It is now cultivated chiefly in the southern half of the state. But the growing season proved too short in some areas and water too scarce in others. Producers soon found other crops or more suitable land uses. Nevertheless, cotton, following the westward migration of the crop in the twentieth century, is still an important cash crop in the southwestern quarter of the state where much of it is irrigated. The size of Oklahoma farms increases from east to west. But on most farms, preharvest operations, such as clearing land, planting, and cultivating, have been increasingly performed by tractors and new farm implements. Landowners therefore required fewer tenants and sharecroppers as resident laborers. They relied instead on nonresident, seasonal laborers, a situation that helped to depopulate rural areas. Tractors also reduced the need for horses and mules. Indeed, mechanization displaced more farmers than did drought and dust storms. Technology in the form of the automobile altered the social geography of rural counties by shrinking the cultural distance between town and countryside. The telephone, radio, motion pictures, and all the accouterments of the electronic age almost destroyed this distance. But the cultural distance in rural counties remained evident in three types of towns: county-seat towns, market towns, and elevator towns. County-seat towns contain government offices, sometimes a hospital, possibly a college, and other public and professional facilities. They are the population centers, housing professional people who provide the varied services available in the county. Market towns usually have the second-largest concentrations of population. In grain-farming areas there are grain elevators, and these towns are a hub of transportation activity. But their sphere of influence is not county wide. Elevator towns are rural villages, usually with a very small business strip along a main highway. Their most prominent feature is a grain elevator adjacent to a railroad track. In rural Oklahoma human activity has always been fashioned by the natural landscape: sky, land, weather, soil, water. Pastoral landscapes predominated, though forested areas in the eastern regions produced a different set of human activities. However, early in the history of the state mineral fuels replaced land as the new frontier of opportunity. Oklahoma emerged as a leading mineral-producing state, especially in the production of energy resources. Even before 1907 statehood, income from minerals was greater than income from agricultural production. As oil and natural gas pools were found in all but six of the state's seventy-seven counties, derricks soon dotted the landscape, along with wellheads, pipelines, tank farms, and some refineries. A huge petrochemical industry emerged in Tulsa, Bartlesville, Ponca City, and elsewhere. The industry grew first with oil and more recently with natural gas. It quickly assumed an urban dimension; beginning in 1897 pools were discovered in both urban and rural areas. At one time, for example, the Oklahoma City oil field comprised about two hundred active wells. The industry developed a culture of its own, dominated by colorful individuals who emerged from a series of rushes that overshadowed all previous quests for hidden wealth in the American West. It also took on a boom-and-bust aspect from 1912 to 1929 as fortunes were quickly gained or lost. Individuals involved in the industry came from all backgrounds and added a cultural dimension markedly different from that of individuals engaged in pastoral pursuits. Although more wells were drilled in 1949 than in any other year to that point, the rate of depletion by the 1960s exceeded discoveries. Nevertheless, in 1975 Oklahoma had five oil fields ranked among the top one hundred producing pools in the nation. Although production in the Panhandle atop three giant gas fields continued unabated, the boom years were over, despite the fact that much crude oil remained to be brought to the surface. The landscape was no longer sprouting hordes of derricks. What remained were environmental hazards with unsealed wells polluting the soil and water, eyesores that are slowly being returned to a more verdant state. But some refineries continue to pollute the atmosphere and pose a threat to people and the environment. The petrochemical industry was headquartered in urban areas, as were the refineries and other operations. Displaced and retired farm families, who generally settled in an urban environment, were joined in the years after World War II by returning veterans and the "baby boom" generation. All helped to change the complexion of Oklahoma cities. Urban sprawl and the growth of suburbs made for marked changes in land use, as did the development of three major interstate highways and newly constructed turnpikes. Crosstown expressways, interchanges, and loops made it possible to live in "bedroom communities" and commute to work. The growth of urban centers further accentuated the decline of rural towns as residents found greater opportunities for employment and recreation in the metropolitan areas. Tulsa and Oklahoma City are the main commercial, industrial, cultural, and health centers of the state. Initially industry was related to developing natural resources and land use; however, it now provides the basis of urban development. In the cases of Tulsa and Oklahoma City, growth also fed upon itself, as business and services catered to the needs of a expanding and diversified population. Manufacturers and processors today can choose between railroads, barges, trucks, airfreight, and pipelines when shipping finished products to market or receiving materials necessary for their production strategies. Although their state possesses virtually no leisure class, Oklahomans romanticize a past with which they have minimal connections. At no time could farming compete with ranching as an ideal way of life, yet most residents were descended from transplanted southerners and midwestern homesteaders with no connection to ranchers and cowboys. More southern than western is the state's approach to most political and social questions, yet more western than southern are the manners of most of its people. Meanwhile, the largest number of Indians in the nation live in a state that regards them neither as black nor white, although both American Indians and African Americans largely remain at the bottom of the social and economic ladder. They continue in part to lead segregated lives, despite the fact that the cultural attainments of Indians are largely recognized. Moreover, in reducing all whites of European descent into one category, the term "Anglo" fails completely to identify any single ethnic group. The cultural landscape, like the natural landscape is exceedingly complex, fascinating, and ever changing. The Oklahoma environment, as already suggested, is still in transition. And the tension between the traditional concern of Indians for the land and the developmental ethos of white residents continues, with the scales heavily weighted on the side of the Christian-capitalist approach to land use. Yet even here the balance is slowly shifting. There is growing concern that Oklahoma is a significant part of the planet with natural resources and human potential that need wise use and preservation in harmony with the natural environment. As it was at the outset, so it remained at the centennial of statehood in 2007: Oklahoma's primary source of wealth still comes from the land. However, ranching, farming, forests, mineral products, and water provide opportunities that allow manufacturing to loom larger than any other factor. Manufacturing makes the eastern half of the state the more metropolitan portion, even though the physical environment is not undergoing marked change. As diverse as its geography are Oklahoma's people, who will add new dimensions to the cultural environment of the state in its second century. Kenneth S. Johnson, "Mountains, Streams, and Lakes of Oklahoma," Oklahoma Geological Survey Informational Series No.1 (Norman: Oklahoma Geological Survey, 1998). John W. Morris, ed., Drill Bits, Picks, and Shovels: A History of Mineral Resources in Oklahoma (Oklahoma City: Oklahoma Historical Society, 1982). John W. Morris, ed., Geography of Oklahoma (Oklahoma City: Oklahoma Historical Society, 1977). John W. Morris, Charles R. Goins, and Edwin C. McReynolds, Historical Atlas of Oklahoma (Norman: University of Oklahoma Press, 1986). Oklahoma Comprehensive Water Plan, Oklahoma Water Resources Board Publication 94 (Oklahoma City: Oklahoma Water Resources Board, 1980). Oklahoma Comprehensive Water Plan, Oklahoma Water Resources Board Publication 139 (Oklahoma City: Oklahoma Water Resources Board, 1997). Oklahoma Water Atlas, Oklahoma Water Resources Board Publication 120 (Oklahoma City: Oklahoma Water Resources Board, 1980). Oklahoma Water Atlas, Oklahoma Water Resources Board Publication 135 (Oklahoma City: Oklahoma Water Resources Board, 1990). Howard F. Stein and Robert F. Hill, eds., The Culture of Oklahoma (Norman: University of Oklahoma Press, 1993). Richard Lowitt, "Environment and Cultural Ecology," The Encyclopedia of Oklahoma History and Culture, https://www.okhistory.org/publications/enc/entry.php?entry=EN007.